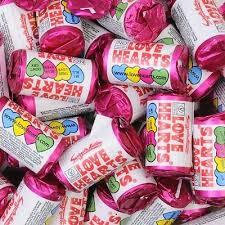 DescriptionSwizzels Mini Love Hearts - little packs of every romantic's favourite sweets. The sweets are actually the same size as the normal Love Hearts - it's just the pack that's mini. These are perfect for you favour boxes and great additions to a candy bar. Swizzels Mini Love Hearts - little packs of every romantic's favourite sweets. The sweets are actually the same size as the normal Love Hearts - it's just the pack that's mini. These are perfect for you favour boxes and great additions to a candy bar.